The Daring Cooks’ July, 2011 Challenge: My Noodle Hands! 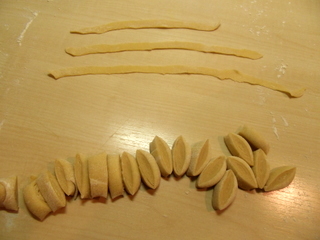 July’s challenge was a really tough one as it is not easy to make pasta at home. The only reason I was tempted was because it is supposed to taste much better than the ready-made one. Well, the verdict is yet out on that. Meanwhile, check out the recipe for home made egg fettuccine below. Make a well in the middle of the flour and pour the eggs and olive oil in the middle. Start mixing slowly till the dough starts getting together. If the dough is sticky, add a little flour and if starts to dry up, add one more egg yolk. However, the thumb rule is one whole egg for 100 gm flour. Divide the dough in four portions. Work with one part while keeping the rest covered as it will start drying up fast. Sprinkle some flour on the kitchen top and roll out the dough portions one by one to form an elongated rectangle. Sprinkle some dough on each side of the rolled out dough portion. This will prevent the dough from sticking. 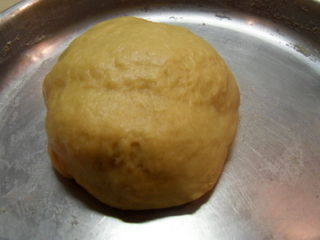 Carefully roll the dough into a cylinder. Cut into equal parts. Unroll. 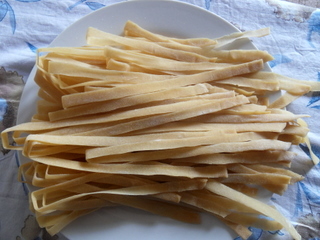 This pasta can be prepared immediately by boiling in water for 5 mins or can be dried for later use. 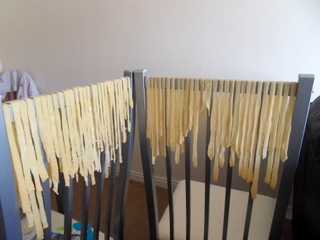 You can dry the pasta on bamboo sticks or the backs of chairs as shown below. 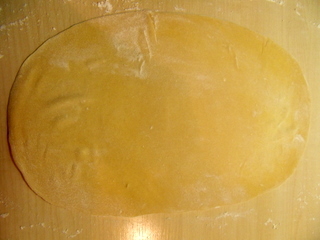 The time taken by the pasta to dry will depend on the thickness as well as the environment. Once pasta is dry, store in an air tight box or freeze it for later use. Check out the amount of pasta obtained from 200 gm of flour. Can’t wait to try it. Great job! Your fettuccine looks perfect! Fresh pasta is the best, I hope you enjoy it!